FingerTec constantly upgrades its software to be in-line with the demand and needs of our customers and clients. Thus, we are delighted to announce the latest release of the Ingress v3.0.3 update that is available for download from our website as well as an online update directly from the software. This new release includes a total of 11 major updates and 11 bug fixes for a better performance. Below are the new features which are included in the recent V3.0.3 release. The icons on all tabs in the ribbon menu has been replaced with a simpler yet neater design. 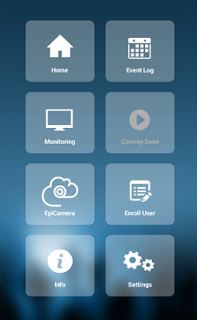 You can now monitor the door/terminal activity from your Ingress Mobile directly instead of staring on the monitor of the PC to keep track of your employees. 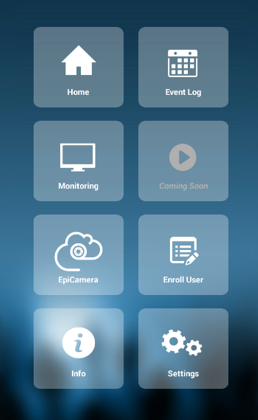 The new Ingress Mobile features include Monitoring, EpiCamera Monitoring, as well as the option to Open the Terminal User Enrolment Page from your phone so that your employee can register their fingerprint at the terminal. Administrators can update all the Group Duty Roster in one go if the need arises without having to do it individually. 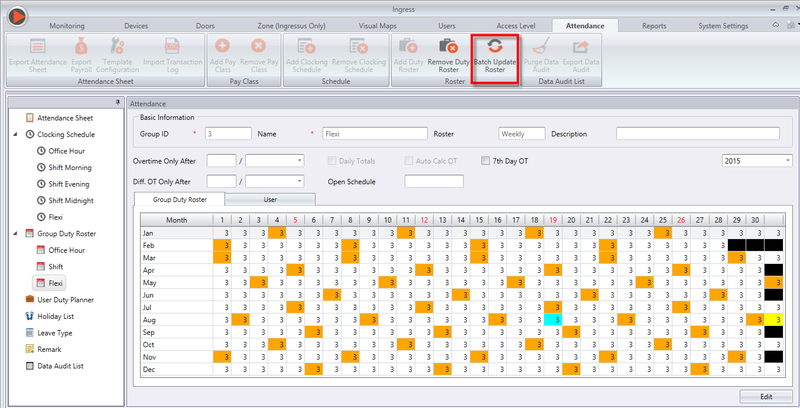 For example, if a particular date is declared as a public holiday, administrators can choose the batch update group duty roster option to set the date as a public holiday to all the existing roster that the company adheres to. 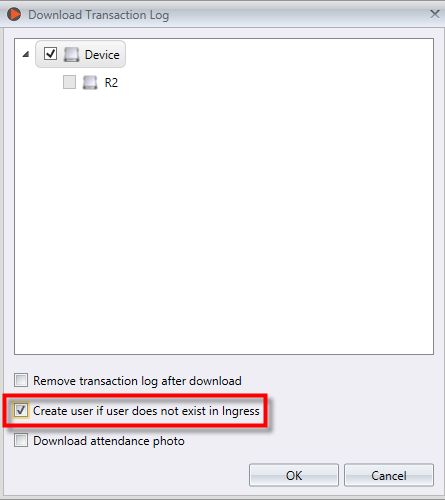 The system administrator can set a more detailed role for each login in the new Ingress release. With this option, system administrators can also control the privilege of each login to lessen the chances of the system being tampered as well as data being edited. If you have already set the Duty Roster for the users prior to using Ingress, you can import the Roster into the software without having to re-configure it again. Go to Group Duty Roster > Click Edit > Import Roster. 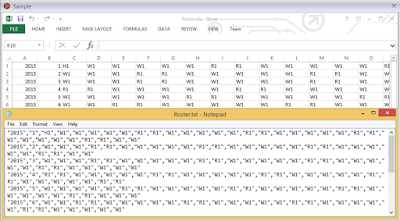 You can import the roster in either Excel or ASCII format. 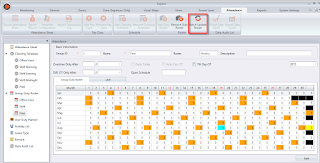 View the sample below as a guideline on how to arrange the column before it can be successfully imported into the software. 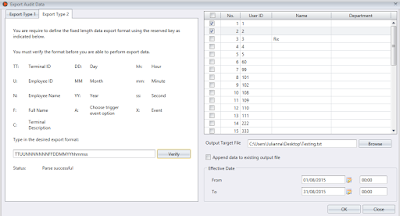 Different 3rd party software requires a custom arrangement of data before the software can compute the data correctly. 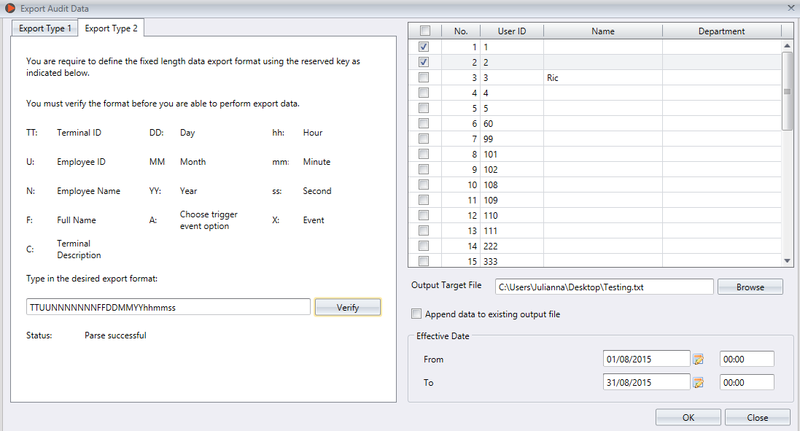 Users can now customize the export format before exporting the data audit list. 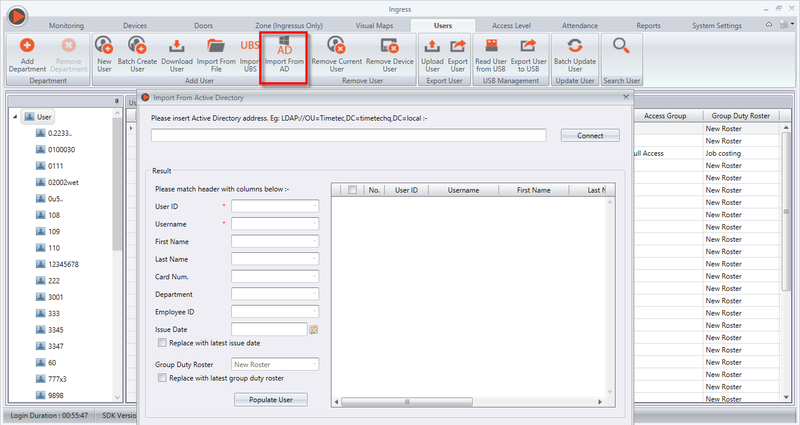 If the user does not exist in the software or has been deleted, administrators can select the option to create the user in the software during the downloading of the transaction data. 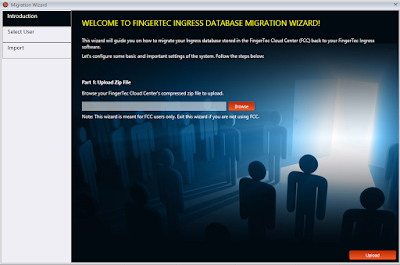 FingerTec Cloud Center (FCC) was launched in the mid of August to backup all the raw data from the terminal in cloud storage. In any case the database in Ingress is corrupted, you can now import the data from the FCC backup. Most users are now migrating over to Ingress from its predecessor, TCMSV2. Whenever older devices are activated with Ingress, all the past offline events stored in the devices might be downloaded into Ingress, which can cause unnecessary data flooding. Three new options have been added into Ingress to control the downloading of data into the Monitoring Tab to reduce the heavy traffic flow and reduce the load on the server for a faster data processing. Remove Offline Event Each Time Terminal is Added (For Standalone Device Only) – To remove the existing offline event in the terminal before the terminal is activated. 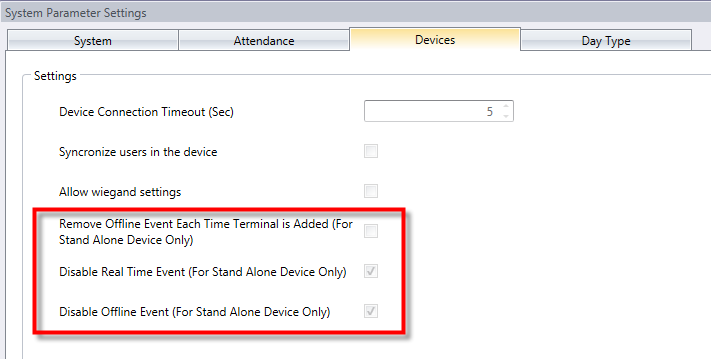 Disable Real Time Event (For Standalone Device Only) – To disable data-flow into Monitoring module (which are mostly used for Access Control devices). Disable Offline Event (For Standalone Device Only ) – To disable offline events from being downloaded into Ingress. Active Directory is a directory service developed by Microsoft and is included in most of the Windows Server operating Systems. 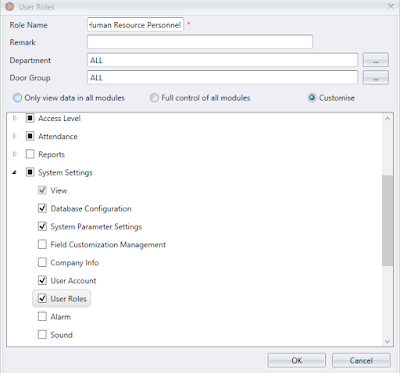 You can create users to the Active Directory of the server system. Once you have the users in Active Directory, you can import the users directly into Ingress software without having to key in the user details one by one. Users who paired K-Kadex to Ingressus can now select Pin Plus Password verification mode to gain access into the premises for a greater security. 1. 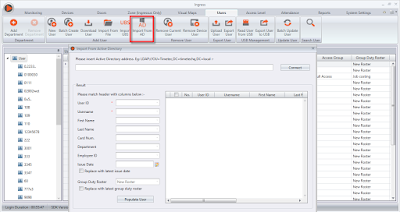 Fixed download transaction log issue from Ingressus. 2. 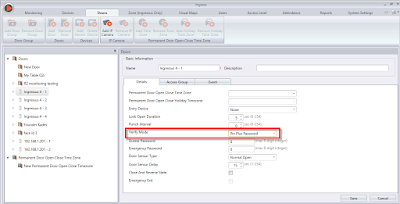 Fixed date not displaying correctly in Electronic Time Card report. 3. Fixed user password not migrated from TCMSV2 into Ingress when using Migration Wizard. 4. Fixed Leave Type not migrated from TCMSV2 into Ingress using Migration Wizard. 5. 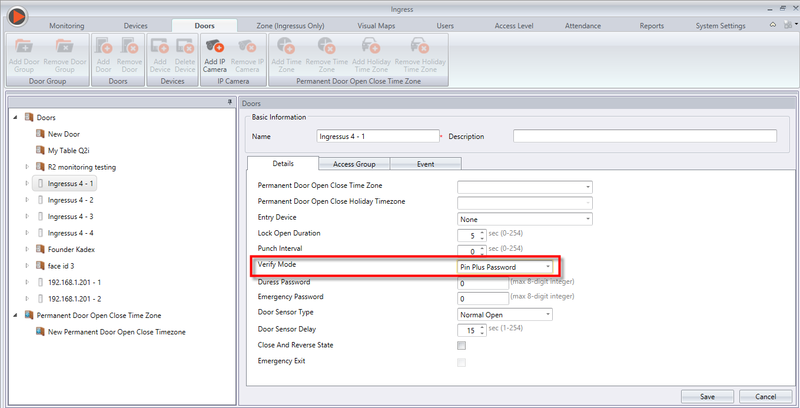 Fixed Work Hour not shown after Migrating from TCMSV2. 6. Fixed user fingerprint auto deleted in FaceID2 issue when device is restarted. 7. Fixed Stand Alone Device Real Time Event not returning after idling for a period of time. 8. Fixed wrong result in date range when user select Bi-Weekly for Payroll Cycle. 9. 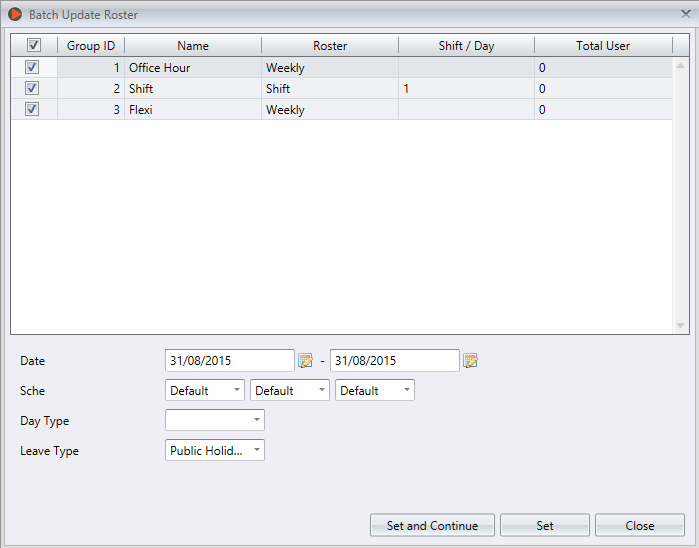 Fixed Work Hour disappeared when user enter leave hour in Attendance Sheet. 10. Fixed Data from Flexi Schedule not displayed in Attendance Sheet. 11. 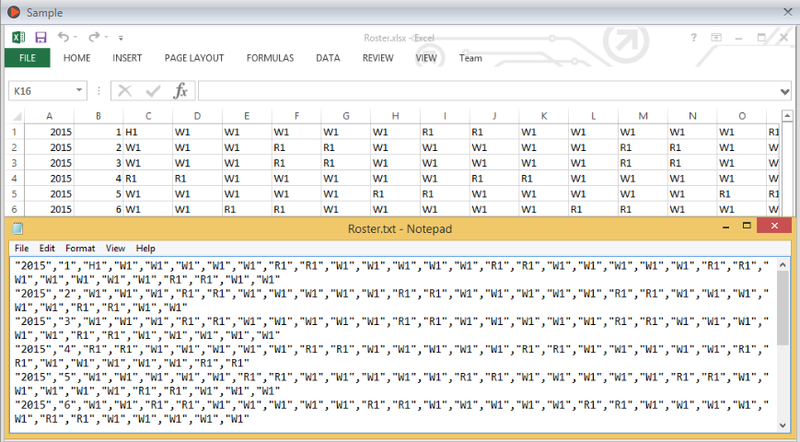 Fixed Wrong Leave Type displayed if some leave type is deleted.